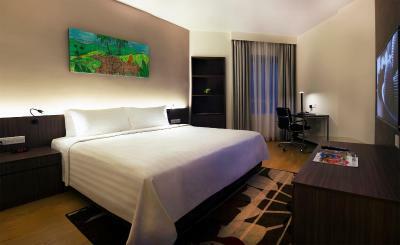 Lock in a great price for Oakwood Hotel and Residence Kuala Lumpur – rated 8.6 by recent guests! I got a room more comfortable than reserved. It was excellent news. 1 living room and 1 bedroom instead of 1 bedroom (due to booking.com if I understood clear). Cozy room with excellent view to the city center. Pleased staff helped me with meal according to my diet. Thank you so much!!! Value for money, nice view beside the swimming pool... windy. Breakfast was good, chef was able to achieve my request for eggs cooked to order as I specified. Room was good, bathroom ok. Shower water pressure not the strongest, but ok. No face cloths in the bathroom, which I thought was the Oakwood standard. Oakwood Hotel and Residence Kuala Lumpur This rating is a reflection of how the property compares to the industry standard when it comes to price, facilities and services available. It's based on a self-evaluation by the property. Use this rating to help choose your stay! 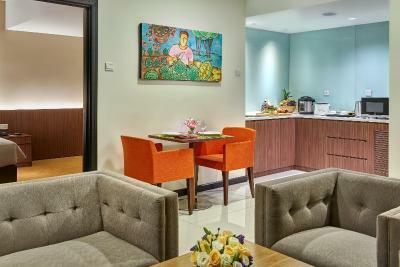 One of our top picks in Kuala Lumpur.Opened in November 2016, Oakwood Hotel & Residence Kuala Lumpur offers a modest variety of accommodations choices to meet the needs of any traveler in the heart of Kuala Lumpur. 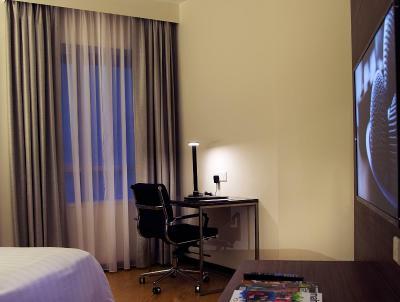 Air-conditioned rooms are stylishly decorated and equipped with a TV. Some units include a seating area for your convenience. 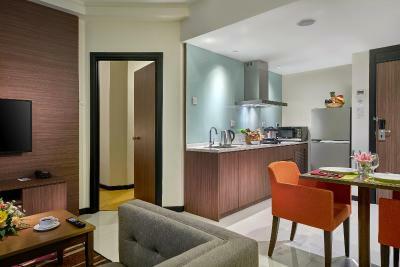 The spacious bathrooms are equipped with rain shower and designer toiletries. Multi-lingual Oakwood staff are available 24 hours a day at the front desk for concierge services. Guests can enjoy a refreshing swim in the outdoor pool, or relax with a drink and snack of their choice from the poolside bar. There is also a fully-equipped fitness center available 24 hours. 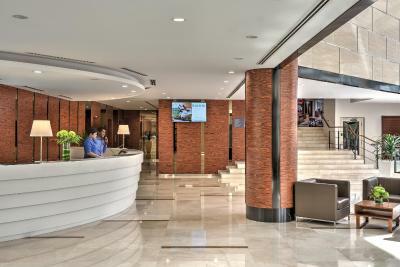 Offering private parking, Oakwood Hotel and Residence Kuala Lumpur is located 0.6 mi away from Suria KLCC Shopping Mall at the Petronas Twin Towers. 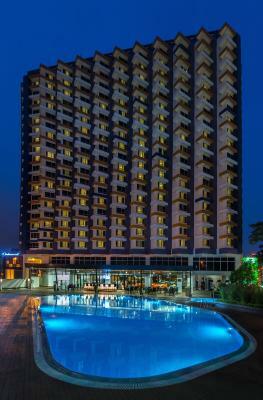 The nearest airport is Sultan Abdul Aziz Shah Airport, 12 mi from Oakwood Hotel and Residence Kuala Lumpur. Kuala Lumpur International Airport (KLIA) is 28 mi from the property. 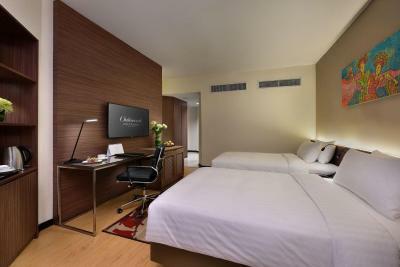 When would you like to stay at Oakwood Hotel and Residence Kuala Lumpur? Offering a city view, this studio offers plenty of in-room amenities that include a flat-screen TV, a work desk and a seating area. Private bathroom features a rainforest shower and complimentary designer toiletries. Featuring a separate bedroom and living area, this apartment offers plenty of in-room amenities that include a flat-screen TV with a DVD player, a work desk and a seating area. Private bathroom features a rainforest shower and complimentary designer toiletries. King or twin beds are available on request, subject to availability. Offering a view of the famed Petronas Twin Towers, this apartment features a separate bedroom dining area and living area. The apartment offers plenty of in-room amenities that include a flat-screen TV with DVD player and a work desk. Private bathroom features a bathtub. The largest apartment offered, this apartment features 2 separate bedrooms, a living area, a well-equipped kitchen and a dining area. The living room offers plenty of space, while a desk is offered in each room. The apartment offers plenty of in-room amenities that include a flat-screen TV with DVD player. Bathrooms come with a shower. 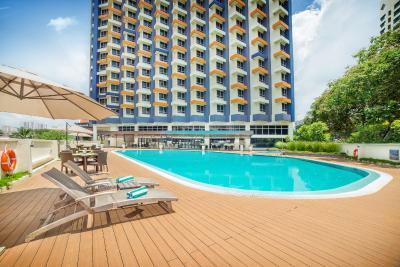 House Rules Oakwood Hotel and Residence Kuala Lumpur takes special requests – add in the next step! Oakwood Hotel and Residence Kuala Lumpur accepts these cards and reserves the right to temporarily hold an amount prior to arrival. A security deposit of MYR 150 is required upon arrival for incidentals. This deposit is fully refundable upon check-out and subject to a damage inspection of the accommodations. Room service dining is so bad.order reveice after 1 hour.please improve its. Breakfast menu .. never change since my last visit ... please do something about it’s.. The breakfast could have had more western choices in the buffet. I loved everything about this hotel! Comfiest bed I’ve ever slept in! The pool was a great size and the staff were absolutely lovely!